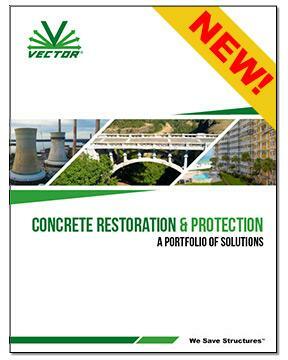 Download our NEW brochure for information about Vector's Concrete Restoration & Protection solutions, including concrete restoration, concrete protection and concrete repair services. With offices in Canada and the U.S., we can help you extend the service life of your business’ concrete, masonry structures, and facilities. You can find our all of the Vector Construction office locations here. You can find out more about Vector Construction's core services here. Vector Construction, has over 50-years of experience extending the life of damaged and corroding structures. Vector focus on concrete restoration in such diverse areas as Toronto, Vancouver, Saskatoon or Winnipeg in Canada, and North Dakota or Iowa in the USA. While Vector is a full service specialty concrete repair contractor, their services extend to structural strengthening, and cathodic protection installation services. The industrial application of these services cover areas such as Bridge Rehabilitation, Chemical Plants, FRP Products, Pulp & Paper Industry, Marine Structures, Commercial Building Restoration, Food Processing Facilities, Silo Repair, Hydro Electric Structures & Dams, Mining & Refining Industry, Power Generation and more.